Going on an amazing honeymoon to sunny San Juan, Puerto Rico! As you can see, I’ve been keeping pretty busy! But I’m hoping that in the new year I will get back to blogging more regularly and keeping anyone out there who cares updated on my transition from new grad to new practitioner. On that note, I’ve been keeping a close eye on what it has actually cost me to get to this point in my career (or rather on the cusp of my new career, which will actually start on Thursday!). I did not include the cost of my OT school tuition/fees, as this number varies widely across programs. However, I have calculated exactly what I spent as I journeyed from student to practitioner over the past several months to give current and prospective OT students a realistic assessment of what it costs to become an OT. Although I had a vague idea of what it would cost to take the boards, apply for a license, etc. I was still blindsided by how much money I needed upfront to actually become a licensed, registered occupational therapist. In the grand scheme of things the amount below might not seem like a lot, when it comes directly out of one’s shallow grad student pockets within a couple of days, it can be quite the financial blow. In hindsight, I recommend that OT/A students who are approaching the end of their academic careers calculate exactly what they will be spending and begin saving for (or set aside) the necessary funds to cover these costs. *The procedure for transferring exam scores varies by state, so confirm with previous program graduates or professors to ensure you are paying for the correct service in your state. **Students in my program receive this book as a graduation gift from program faculty. Because it is so widely used by OT students preparing for the NBCOT exam, the value of a NEW book with digital resources (CD) is included here. Other possible (but easily avoidable) fees are those charged for switching exam dates ($50), arriving late or bringing the incorrect documents to the testing center ($175), or failing to take the exam within the time allotted after the issuance of the Authorization to Test Letter ($75-175). I believe that most OT/A programs are graduating students who are well-prepared to take the exam, even if they might need to spend time reviewing specific interventions, developmental stages, measurements, etc. to answer some questions. While I wasn’t 100% cool, calm, and collected on the day I took the exam, I did feel confident in my clinical reasoning skills, practical knowledge, and overall ability to pass. Ultimately, actually becoming a licensed, registered OT isn’t easy or inexpensive. I spent the bare minimum on study materials and exam costs, and still it was almost $900 when all was said and done. I’m thankful that my family was able to help me cover some of these costs and help me complete the final steps in becoming an occupational therapist, and I’m proud to say that I am now Lauren Jones, MS, OTR/L! Update 6/12/17: If you are making the transition from student to practitioner soon, check out this post from the OT Potential website for useful tips and resources that will help you find the right OT job for you! This post is Part III of a four-part series to help occupational therapy students and practitioners find ways to fund their OT education. 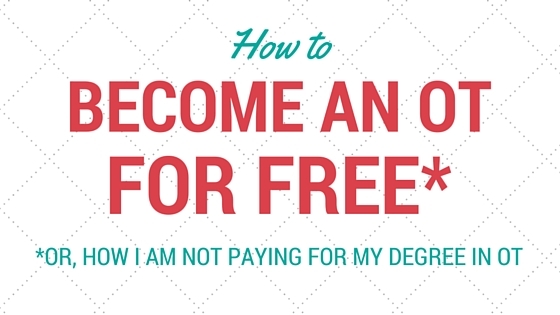 This post is full of tips, advice, and resources for current OT students who are looking to save money as they pursue their degrees! In case you missed them, you can read the first two parts of my Funding Your OT Education series for advice about how to find funding for OT school and what you can do before starting OT school to make the most of your money. Read on to learn about ways you can save as an OT student! This post is Part II of a four-part series to help occupational therapy students and practitioners find ways to fund their OT education. You can read Part I here. People who are applying to OT school are often in the difficult position of deciding which program they will attend before they have a 100% clear understanding of what their financial situation will be at each institution. It’s a tough spot to be in, but these tips will help potential OT students avoid as much debt as possible from the start of the application process onward. Note: These tips are primarily geared towards students applying to graduate level occupational therapy programs, which are generally more expensive than occupational therapy assistant programs. However, much of the information still applies no matter which OT degree you are pursuing! One of the many reasons why people don’t apply to graduate programs – or pursue further education at all – is that they believe it is too expensive. In the wake of the Great Recession, many people are struggling to make ends meet, and the thought of taking on [more] loans – even to pursue their dream career – is just too much. Because I was fortunate enough to earn my way through two separate higher education programs with my tuition* fully covered at both, I want to share my story and offer the best advice I can about how to go about finding funding for your graduate education in occupational therapy (or anything else, for that matter!). I’ll start by saying that my experience is somewhat rare, but it’s absolutely not unheard of. A friend of mine went from undergrad to her master’s to her PhD at the same institution without stopping, and she doesn’t owe a dime – I swear! She accomplished this by developing strong relationships with people in the departments where she studied to help her find funding, include her on funded projects, and connect her with other opportunities (and you can too!). While I have changed schools since undergrad, I definitely haven’t changed tactics. If anything, my skills for finding and earning funding have only been further honed by my decision to pursue a graduate degree in occupational therapy. Lest you think that I am taking all of the credit for my achievements, I absolutely must credit the good Lord for all of the many blessings (financial and otherwise) in my life that have allowed me to go to school for almost nothing! I also have wonderful friends and family members who have read scholarship essays, cheered me on, and picked me up when times were not as good that I am so, so, thankful for. With that said, I am going to be very open here about my financial situation, not because I am bragging or showing off, but to show others how I am paying for grad school and how you can go about funding your own OT education. Read on to find out how I’m becoming an OT for (almost) free!